Shimokitazawa is the bohemian village of Metropolitan Tokyo. From cafes and curio shops to used clothing and live music clubs, this little part of the city has a lot to offer. Here, Mario Leto walks us through the old part of town and shows us the possibilities for a day with the family. 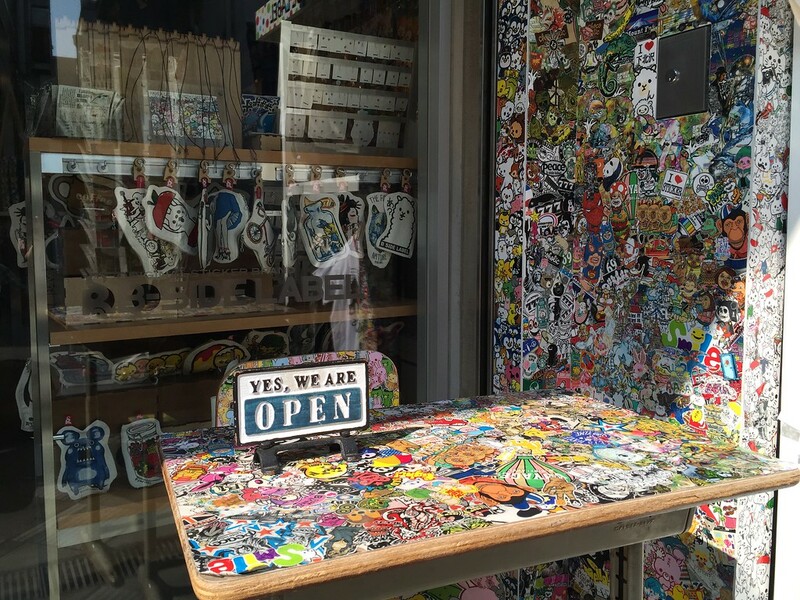 Where Shibuya caters to the young and edgy, and Harajuku to the young and cutesy, Shimokitazawa is a hippy haven for the young and earthy. To give you a taste of what to expect, the first five travel websites on a Google search offer the following adjectives to describe the area: independent, bohemian, hipster, trendsetting, and laid-back. 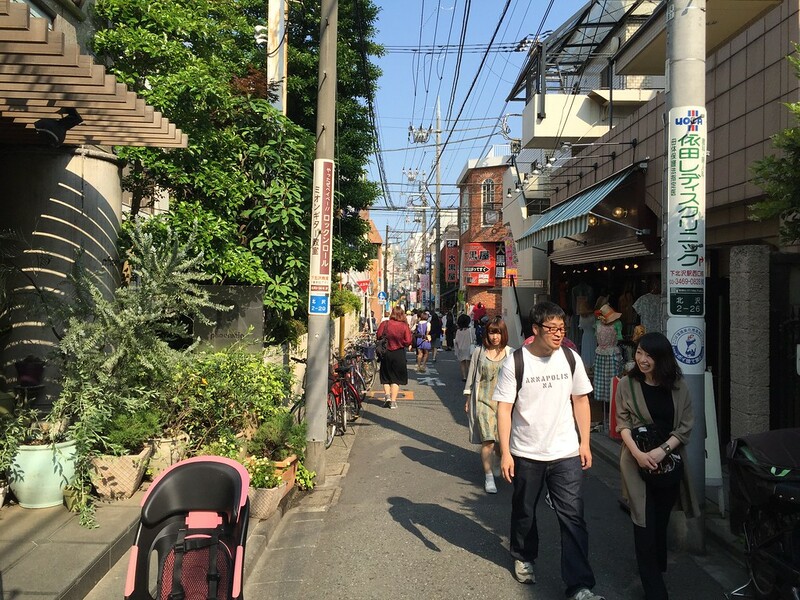 According to the Japan National Tourism Organization (JNTO), Shimokitazawa is consistently one of the top three places where young people say they want to live. 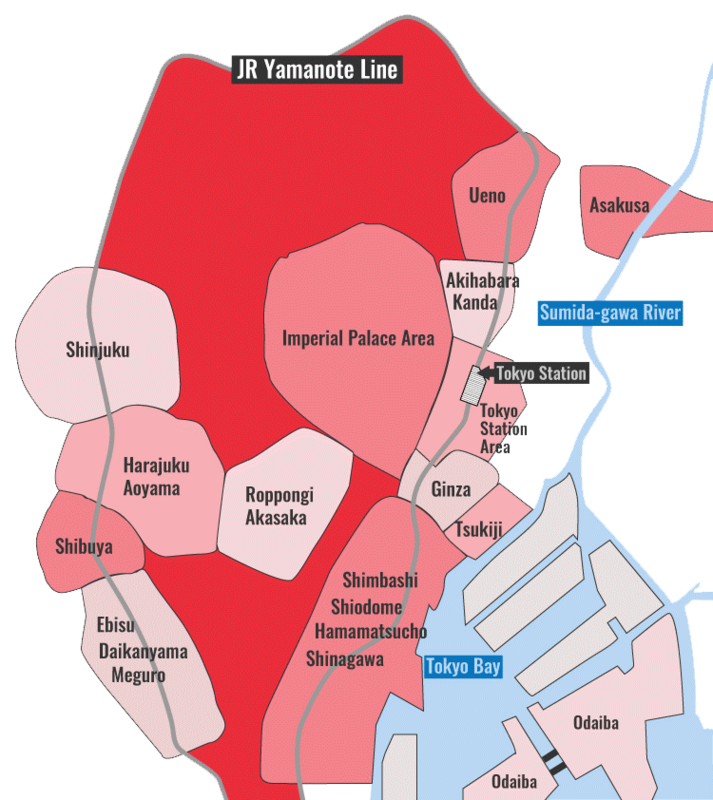 Originally a farming community, Shimokitazawa (informally shortened to Shimokita) transformed into a primarily residential district after the Great Kanto Earthquake of 1921 as Tokyo inhabitants migrated to the countryside to escape the dangers of a future urban disaster. After miraculously surviving the allied fire bombings of WWII, the area was then transformed into a US second-hand market for soldiers after the surrender. Remnants of this market still exist today. The 1970s saw the arrival of the hippy youth, and the rest is history. 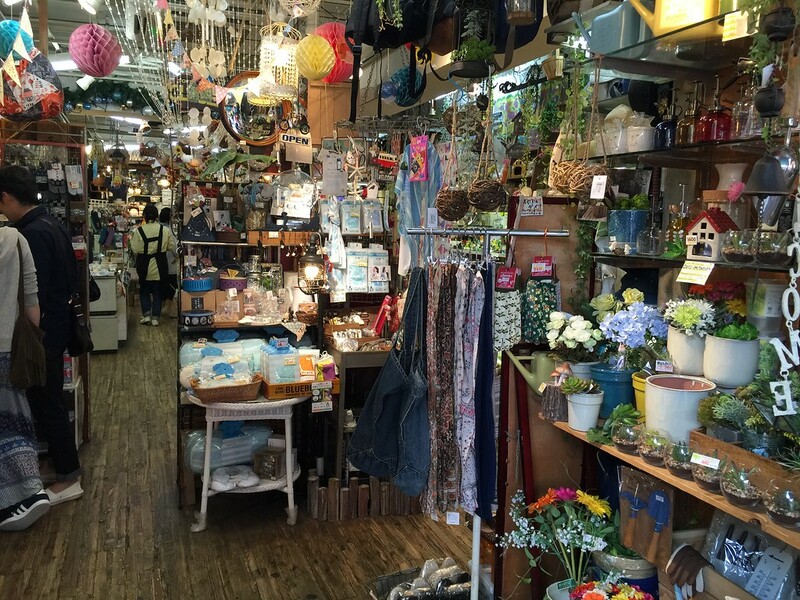 It is this unique blend of the residential, the commercial, and the trendsetting that make Shimokitazawa the bohemian paradise it is today. The streets are narrow, discouraging cars and large buildings, and the afternoon-stroll atmosphere is perfect for shopping and relaxing in the numerous cafes and clubs that dot the landscape. 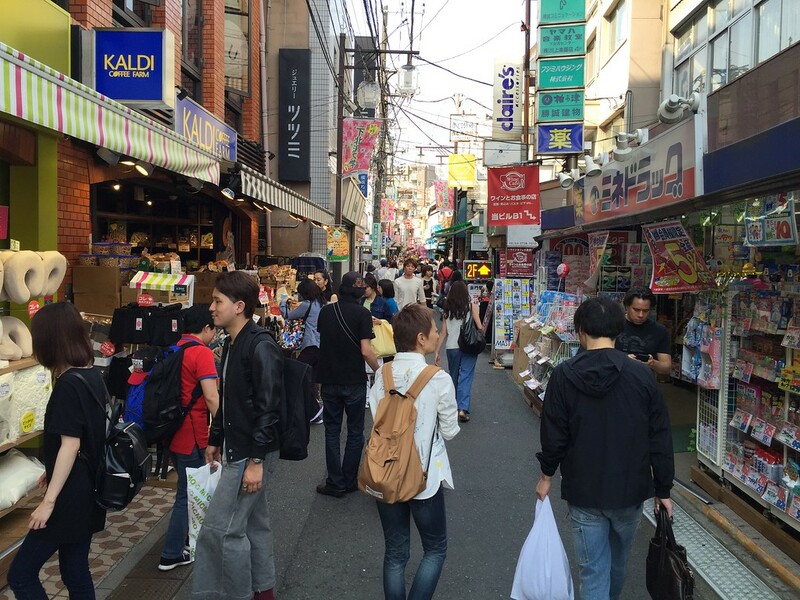 Once again, getting to Shimokitazawa will depend on where you are in the city. Coming from Shinjuku, take an express train on the Odakyu line and get off at the second stop (7 minutes, ￥160). From Shibuya, get on an express train on the Keio Inokashira line and get off at the first stop (3 minutes, ￥130). Local trains work well too but take slightly longer. For my Saturday afternoon journey, I arrived from Shinjuku and made my way to the North exit of the station. 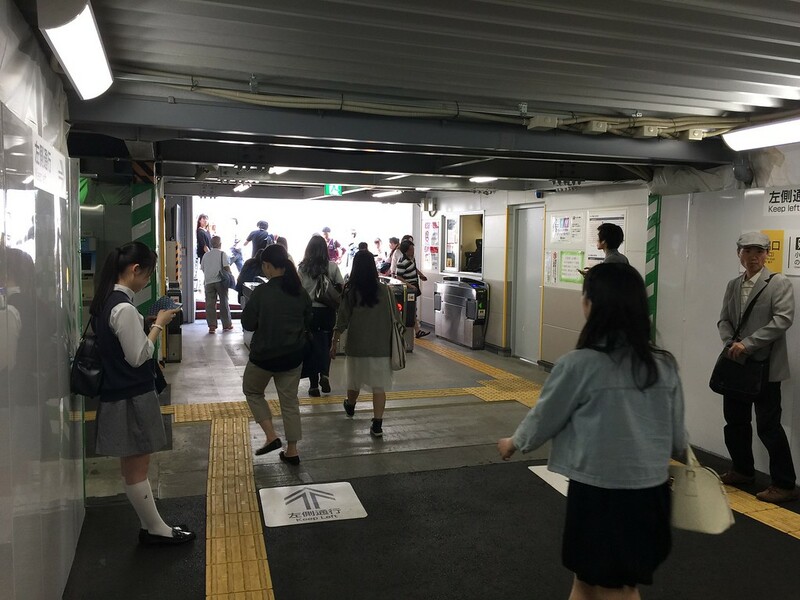 Word of warning: Shimokitazawa Station is a mess. In 2013, the Odakyu line tracks were removed from ground level and placed three stories below the surface. There is also continuing construction to separate express train tracks and local train tracks. The short of it is that the station is a maze of temporary construction walls. Add to that confusion the presence of two private train lines (Keio and Odakyu) sharing one station with four exits, and there is great potential for walking in circles and talking incoherently to yourself. Your goal should be the North Gate. Follow the signs, read the maps, and ask for help if necessary. At the end of the day, just remember this: There are no wrong turns in Japan, only new directions. Any exit will offer myriad possibilities for gawking, shopping, eating, and drinking. 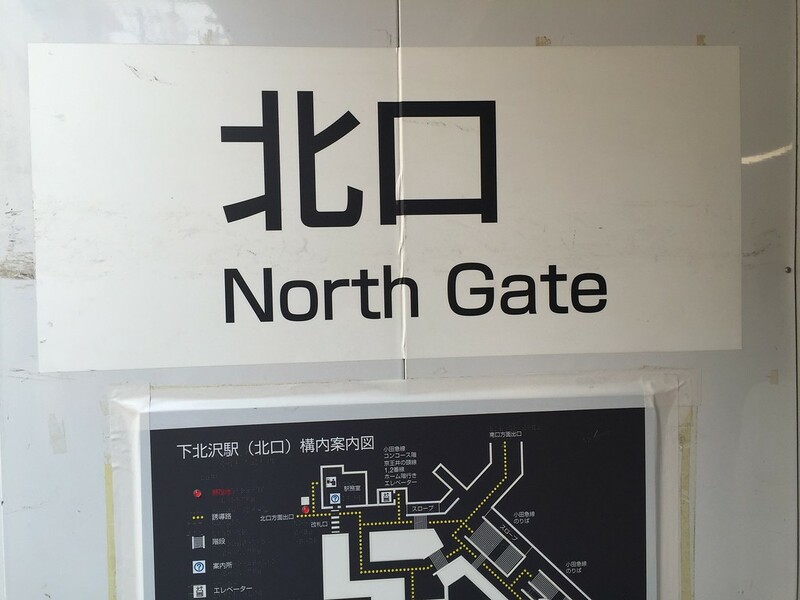 I chose the North Gate because the north side of the Keio tracks is the least contaminated by urban development. 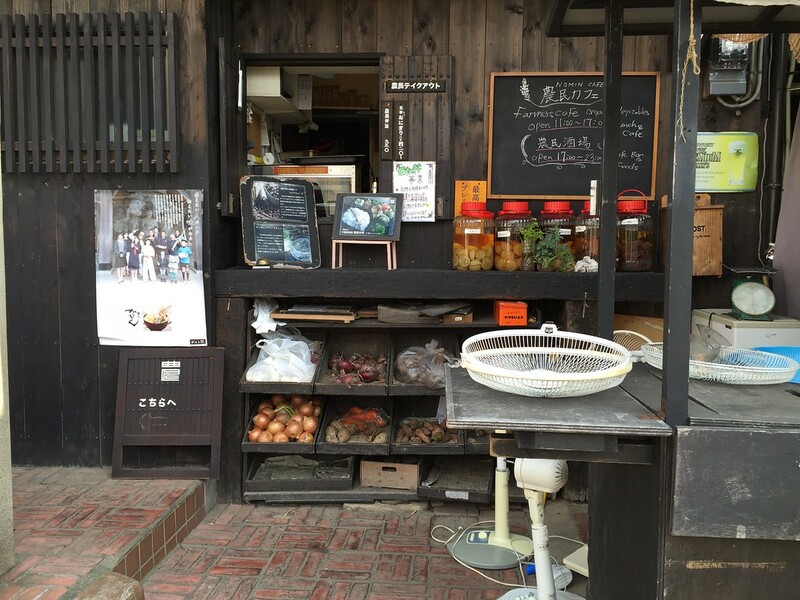 The shops are small, old, and quaint, and this is the essence of Shimokita. The south side of the Keio tracks has lots to offer as well, but it’s noisier and more developed and, well, you can get that anywhere in Tokyo. The North Gate seems to move ever so slightly with the fluid state of construction, so your ultimate goal should be standing at an elbow corner nearby, looking down a long busy street with Peacock and Family Mart on your left. You can use this long straight road as a compass bearing. I’ll refer to it as the main road from now on. I recommend walking its length once first before weaving back and forth on the narrow crossroads. There are several parallel roads as well and all have something to offer. The north area is about as close to a grid as you’ll get in Tokyo, and that’s rather nice for the newcomer. If your journey is like mine, you’ll walk into at least a dozen shops on the main road alone and after an hour or two of boosting the Kitazawa economy (a more civic way of referring to the Shimokitazawa area: Shimokitazawa is merely the station name), you’ll be both thirsty and craving more shops at the same time. Never fear: there is a great little take-out coffee shop on a parallel road to your left when walking away from the station. 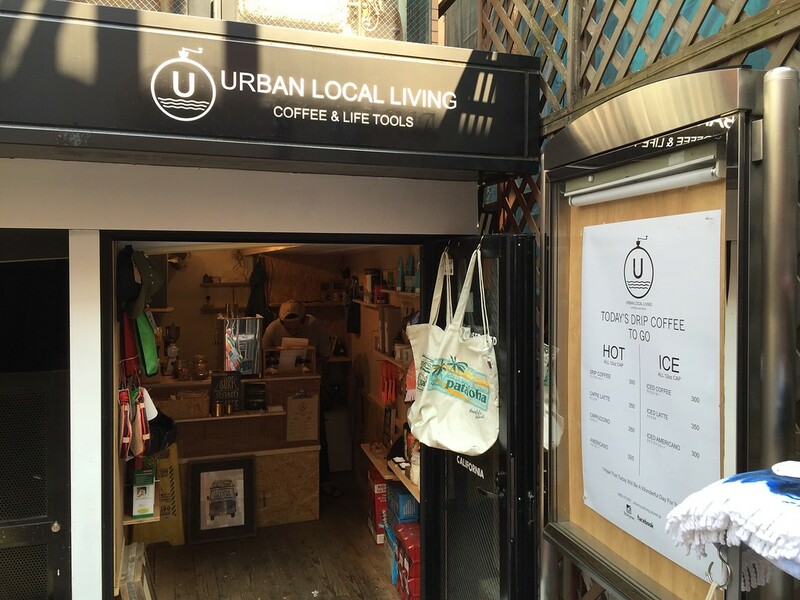 The sole hipster at Urban Local Living will make you a coffee fresh from the grounds, iced if you like, while offering a display of (mostly) American DIY gadgets for sale on the walls. Recommended, if only for the idiosyncratic marriage of coffee and tools. Turn left at the Dr. Who phone booth and take the first right. You can’t miss it. 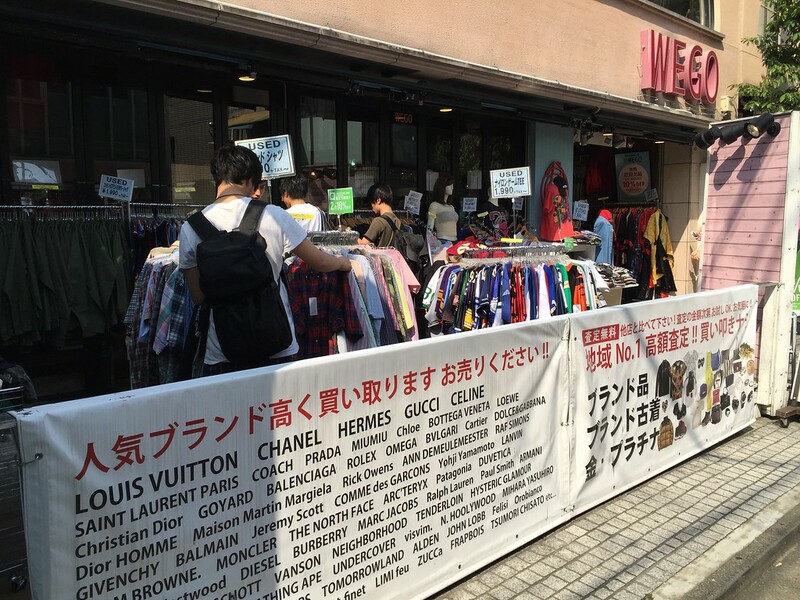 According to Keiro Hattori (2012) in his article about Shimokitazawa (PDF link), there are approximately 135 apparel shops in the area, and of those 135 shops, 45% are second-hand shops. 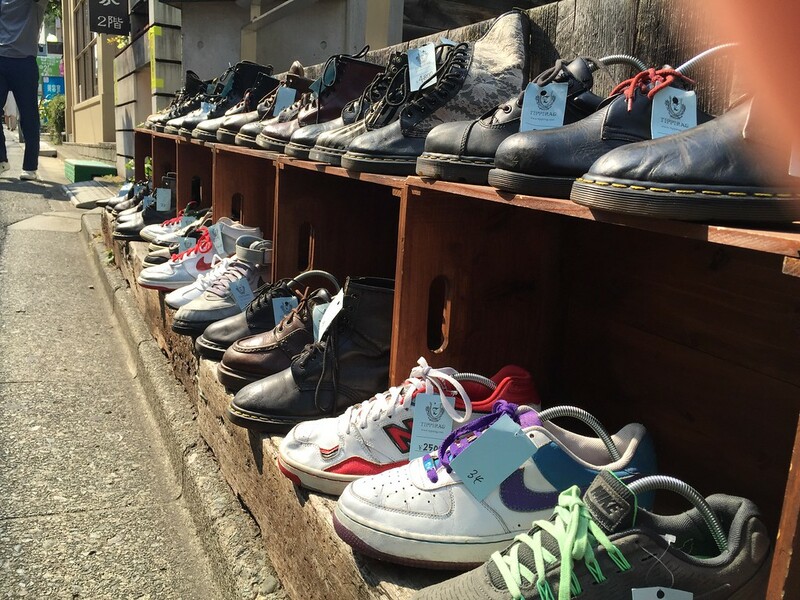 While the numbers are not common knowledge, it is a well-known fact that Shimokitazawa is the place to buy used clothing. If you are indeed interested in acquiring used clothing, then you would do well to learn the meaning of the word “vintage”. In a nutshell, the word “vintage” means quality and high prices. I’m not always sure about the former, but the latter consistently holds true. It works for clothing the same way that the word “antique” works for furniture. 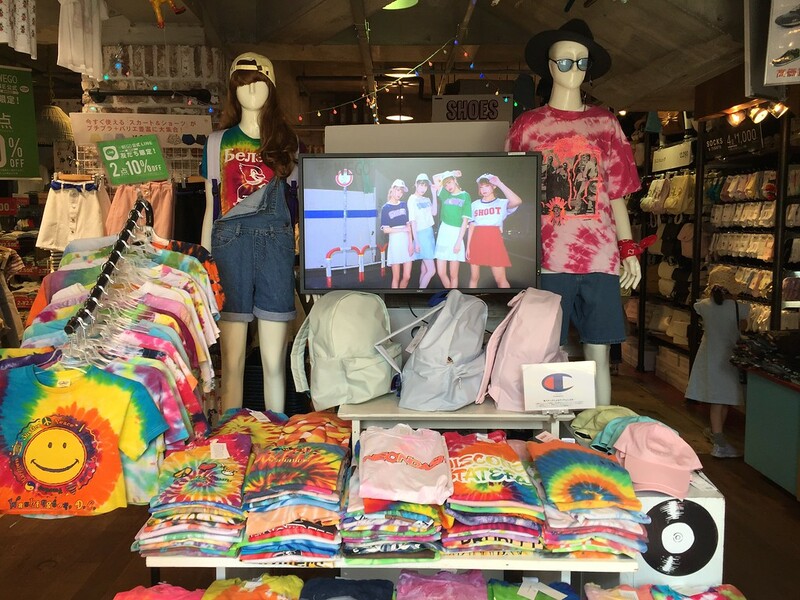 Shops in the Shimokita area cater to both vintage and standard used clothing, so don’t swallow your tongue when you flip over the price tag of a single vintage t-shirt and see the same numbers that appear on your monthly cell-phone bill. After shopping around for a while and getting jacked up on caffeine, it was time to find a place to eat. In Shimokitazawa, this is never difficult. There are cafes on every corner and along the straight parts in between. The place I finally chose was called Nomin Cafe. The reason I chose it is because they use seasonal organic vegetables, make everything from scratch (no prepared, processed food), and offer variations to match dietary restrictions, like vegetarian or gluten-free. From the main road, turn left (again) at the Dr. Who phone booth and walk to the end of the street. You should see it on your left just before the T-intersection. 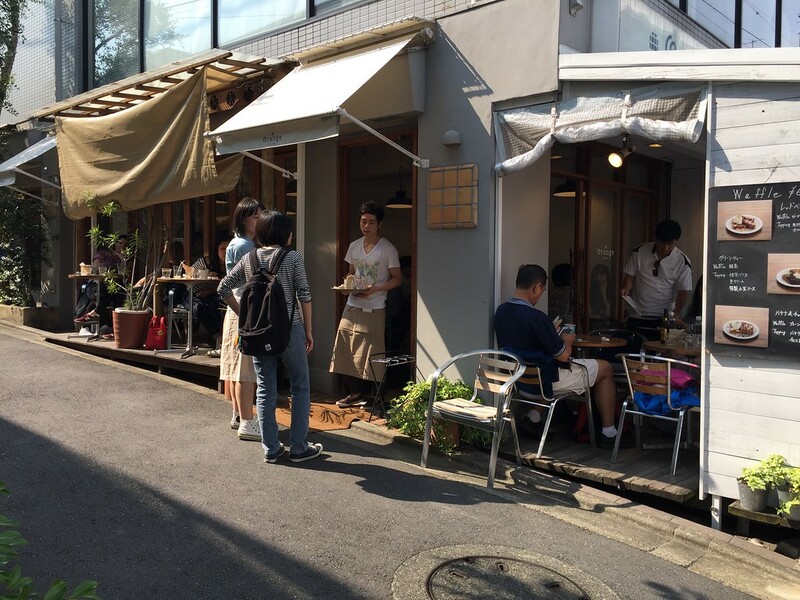 At Nomin Café, there is seating on the first floor, outside on a patio in the back, and in a few rooms upstairs on rush-woven tatami mats. If you have bad knees or have trouble standing up from the floor, then I recommend requesting a table on the first floor. One of the upstairs tatami rooms is specifically for families with young children, offering a basket of toys to play with and picture books to read. 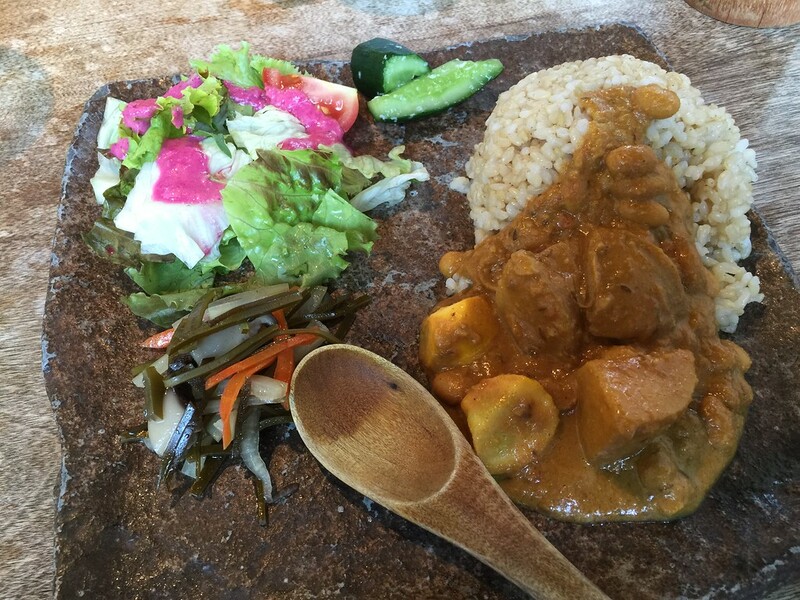 I went with my family and my wife got the curry and brown rice pictured above (￥1280 with vegetable soup and lotus-root tea) and I got a kind of Japanese delicatessen plate with brown rice (￥1280 with same veggie soup and lotus-root tea). The kids got kids’ plates (around ￥900) and nothing lasted very long. Perhaps that was because of the long wait for the food (very crowded early afternoon), but more likely because the food was super delicious. English assistance available! If at this point you are thinking, “Shimokitazawa sounds nice but I’m not sure I have the time to go there. Maybe another time,” then I should probably tell you that there may not be another time. 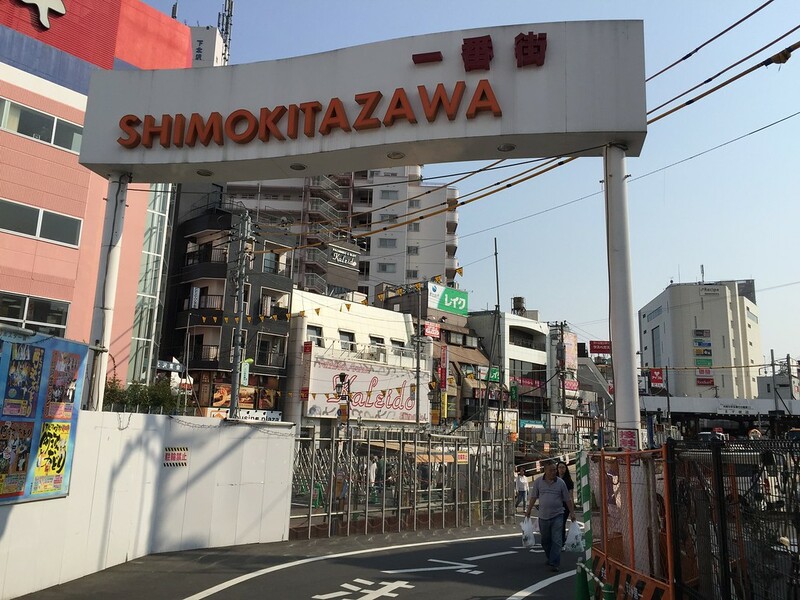 The face of Shimokitazawa may change in the near future, and the culprit is the Shimokitazawa highway project. Conceived of around 60 years ago, the highway project plans to put a 26-meter-wide road right through the center of the hipster shopping district. In addition, the ward government is planning to allow taller buildings to be built where previously strict laws retained the bohemian village atmosphere. As of this year, it seems that the project has been delayed and perhaps even scrapped due to strong, consistent opposition. Others suspect a lull in the storm. Make your plans now while you can. 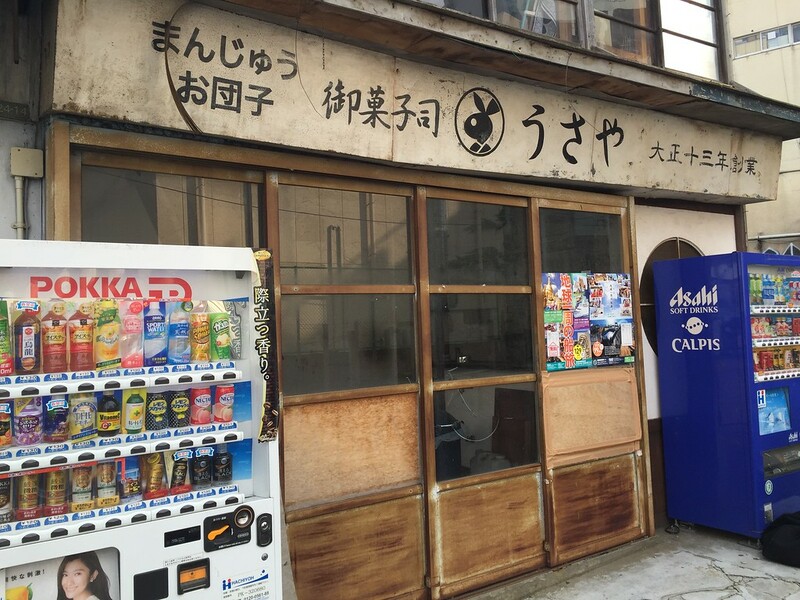 Aside from used clothing and cafes, the next most ubiquitous kind of shop in the Shimokitazawa area is the sundries shop. Sundries are miscellaneous items: too small and too many to name individually. Take a look at the picture above. That was taken inside a sundries shop called T-Four. Fake flowers, gardening tools, lights, lamps, signs, and stickers. And that’s only the entryway. It’s a small shop for sure, but the variety of merchandise is vast and time-consuming. And good fun. You never know what you may find and never find again. T-four is on the main street near the far end on the left, across from Gusto. Another shop worth visiting, despite being part of a larger chain, is Ehimade, pictured above. The name Ehimade is actually a combination of two words: “Ehime” and “made”. 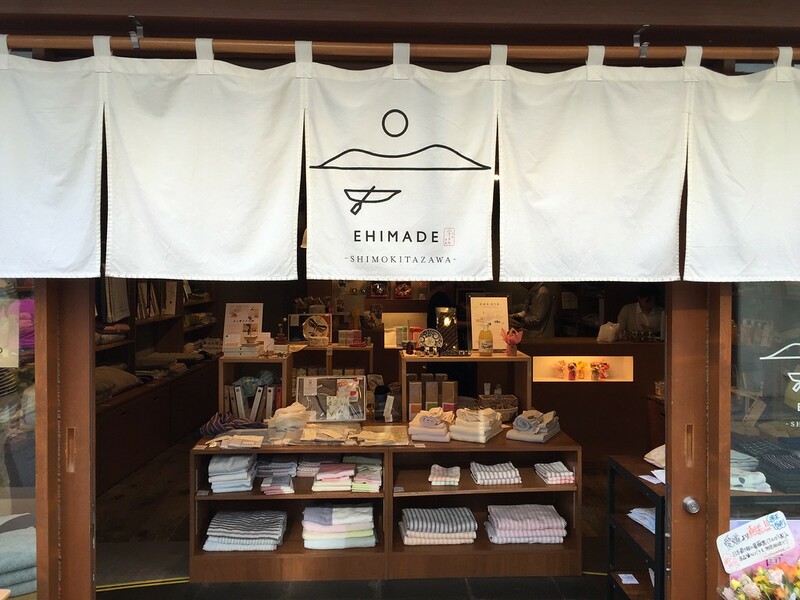 Together, they form the clever name of a shop that sells artisanal products from Ehime Prefecture, most notable of which is the imabari towel, the greatest towel in the universe. If aliens are indeed visiting planet earth, your best chance to see them is in an Ehimade shop picking up some towels for their interplanetary travels. As the list of laudable imabari towel attributes is quite long, let me just say that their absorbency is next to none. In-factory quality control demands that when dropped onto the surface of water, the towels must sink within five seconds. Yeah. I know. Living in Tokyo again after seven years in the countryside, I am surprised at how much walking the city demands. In the countryside I’d owned a car, but the public transport in Tokyo is stellar and cars are undoubtedly unnecessary. And if you’re a planet walker like me, then even public transport is often avoided for the more enjoyable treks between stations. As Frank Orrall from Poi Dog Pondering says in the song The Ancient Egyptians: You get to know things better when they go by slow. And no doubt that walking all day creates an insatiable hunger, especially shopping around the neighborhoods. Yes, lunch was lovely and filling, but two hours later the whole family is dying for a snack to stave off the belly pains till dinner. Natural House is a small chain store in the Kanto area of Japan, but comparatively hard to find. The main store is in Aoyama, a short walk off of Ometesando Road toward Shibuya Station, and is worth a visit if you’re interested in health food. Luckily, Shimokitazawa has a small branch too, about a block from the North Gate walking along the tracks away from the main street. The shop’s motto is “Organic Life & Sustainability”, and indeed most of their products fall into that category. If you are familiar with the grocery store in the U. S. called Whole Foods, then I need not explain any more. 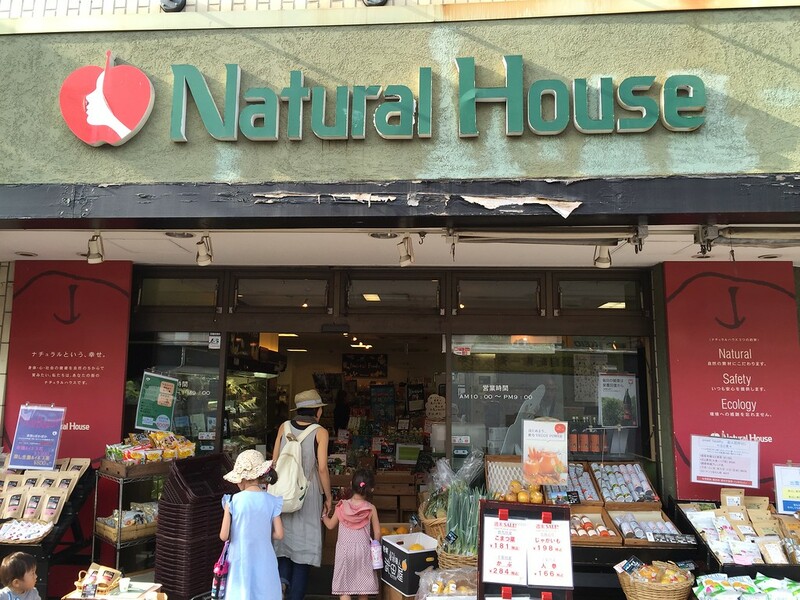 Natural House is Japan’s answer to Whole Foods, albeit much smaller and spreading at a much slower pace. From fresh fruits and vegetables to prepared dishes and packaged snacks, this is the place to satiate your hunger and appease your conscience at the same time. I wouldn’t exactly call Shimokitazawa a place for children, but I could think of many other places that are a lot worse. The two advantages that Shimokita has over other parts of the city are 1) the lack of cars, and 2) the laid-back care-free atmosphere. I guess you could also add “sundries shops” to that list because now that I think about it, my kids could open their own sundries shop with their piles of miscellaneous toys and other knick-knacks stolen from the sofa cushions and my own bedroom bureau. 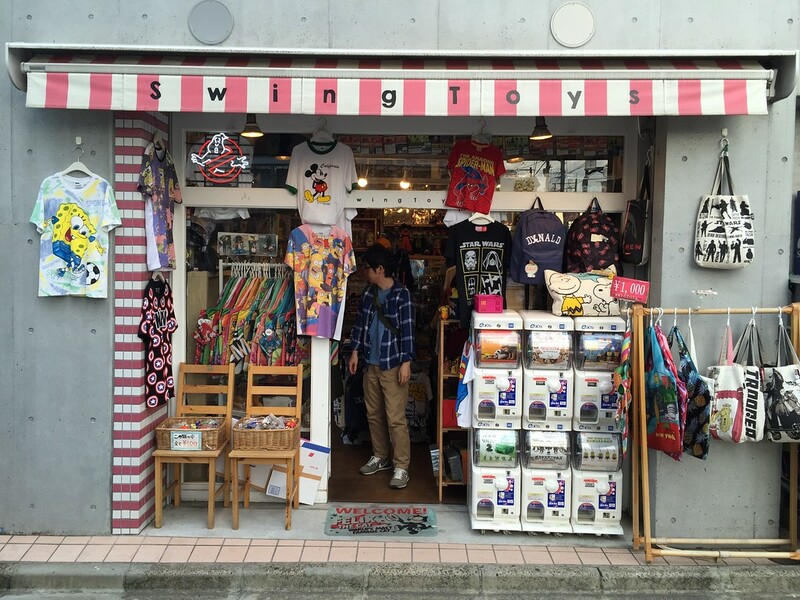 Speaking of toys, you and your kids might enjoy stopping by Swing Toys toy shop. 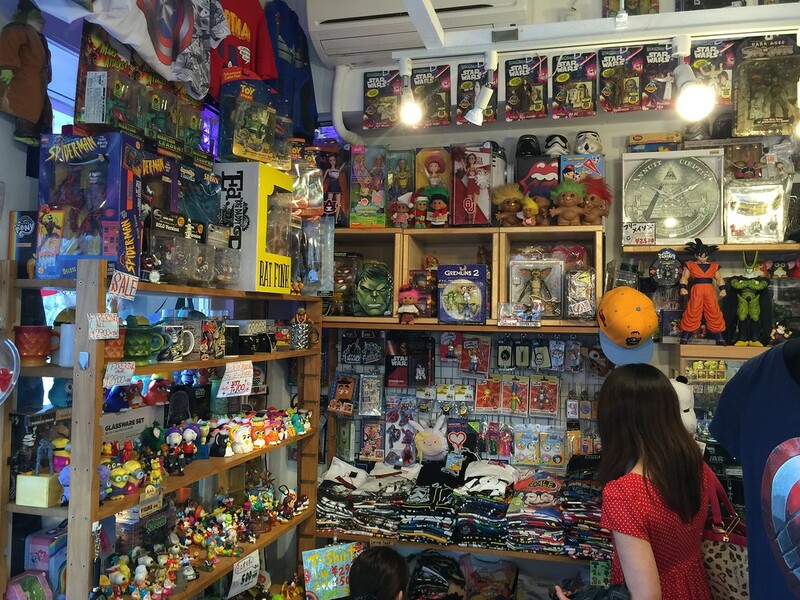 From cartoon character key chains and action figures to t-shirts, mugs, and shopping bags, Swing Toys has just about anything for that nerdy part of your personality that you hide from your co-workers. Star Wars? Check. Peanuts? Check. Disney? Check. Pixar, Ghibli, Toei, and Marvel? Check. Some of the toys are “vintage” and a bit pricey, but there are bargain shelves with action figures that are sure to please the whiniest kids. My girls chose My Pretty Pony dolls and off they galloped on every fence, bush, and train station railing all the way home. You’ll find the shop along the tracks on your left on the way to Natural House. It’s hard to make recommendations when the options are so many and so varied. 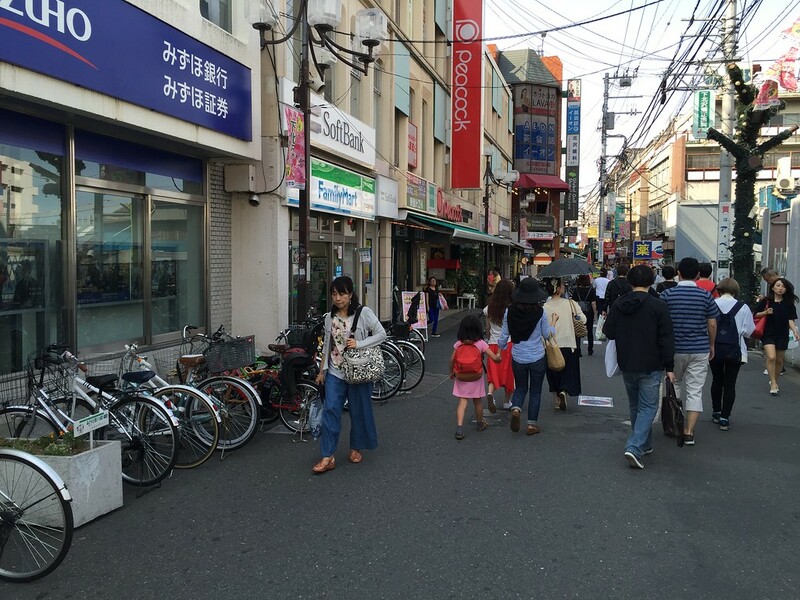 Most of the fun to be had in Shimokitazawa is in the exploration. And of course everyone is different and demands different kinds of entertainment. So let me just throw out a few more shop names to tempt your curiosity. For affordable used clothing, try Wego, Big Time, or Mode Off, all within a block of each other on the North side of the tracks, and Chicago on the South side. If you are into stickers and labels, try B-Side Label (pictured above). Turn left at the end of the main street and it’ll be a block up on your right. If you’re into antiques, try Antique Life Jin across the street from B-Side Label. 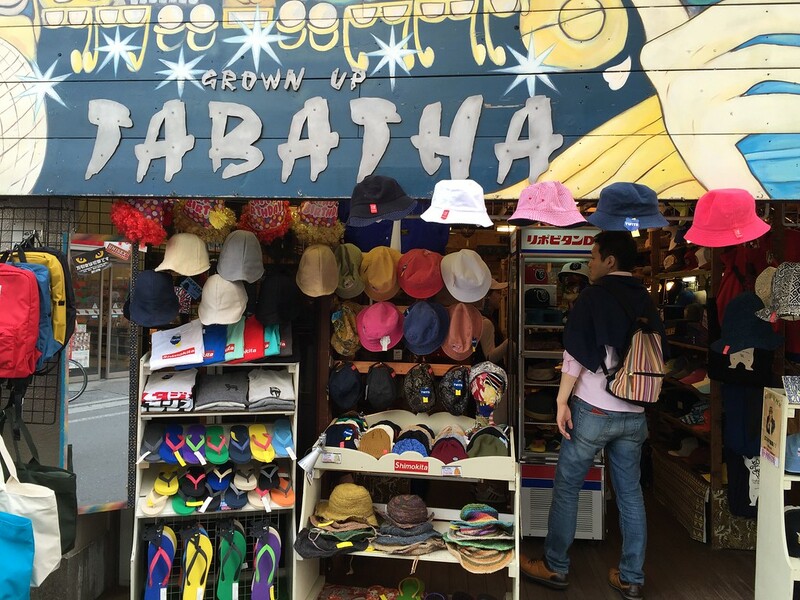 And if you’re into hats and caps, try Grown Up Tabitha on the south side. To wax poetic, these are just a few grains of sand on the beach of Shimokitazawa. Finally, no piece of travel writing about Shimokitazawa would be complete without mentioning 1) the theaters, and 2) the nightlife. Probably not of much interest to the international traveler is the large theater scene which requires a decent understanding of the Japanese language. But alcohol and music transcend language and cultural boundaries. My own situation with young kids prevented me from enjoying any live music on the day I visited, but if you have the time and the energy, Shimokitazawa is the place for it. Keiro Hattori (2012) once again puts things into perspective: There are 21 music clubs in Shimokitazawa and 243 in all of metropolitan Tokyo, which means that 8% of all the music clubs in Tokyo are in the Shimokitazawa area, an area that makes up only 0.01% of the land. Repeat: 0.01% of the land in Tokyo contains 8% of the music clubs. Shebang! If you know the bands Bump of Chicken, Asian Kung-Fu Generation, or Thee Michelle Gun Elephant, you will be happy to know that they all got their start in the clubs of Shimokitazawa. For the musically inclined, any general web search should be able to point you in the right direction. Try starting with the list of clubs in this article by Hattori, page 25. Mimes. What the hell are mimes? And why are they everywhere in Japan? For some people, they are the stuff of nightmares. For others, they are the stuff of nightmares. Well, there’s always something to learn, I suppose. For mimes, here it is: Modern mime performance, developed in 19th-century Paris, was influenced by Japanese Noh theater with its use of masks and physical expression. Yep, that makes sense. 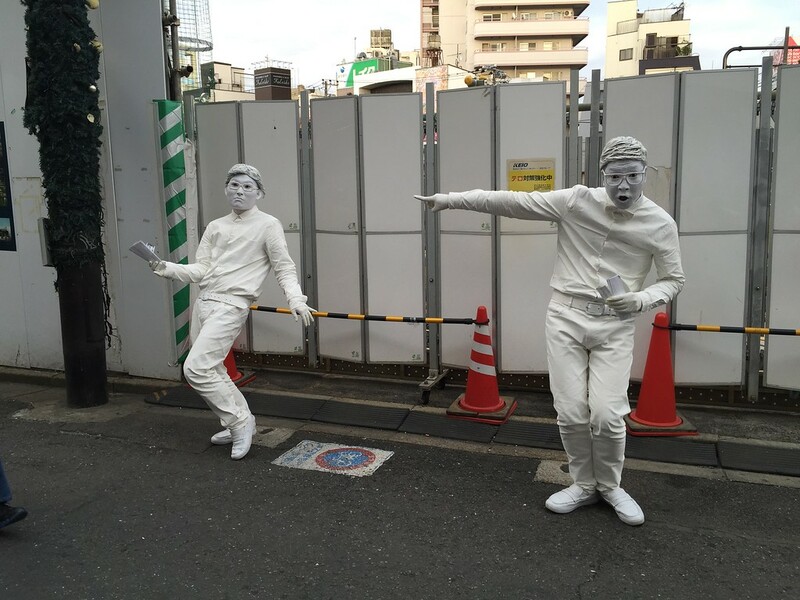 And it makes sense to see mimes in a famed theater district of Tokyo. Personally speaking, I prefer my mimes painted blue and playing pipe drums, but that’s just me. 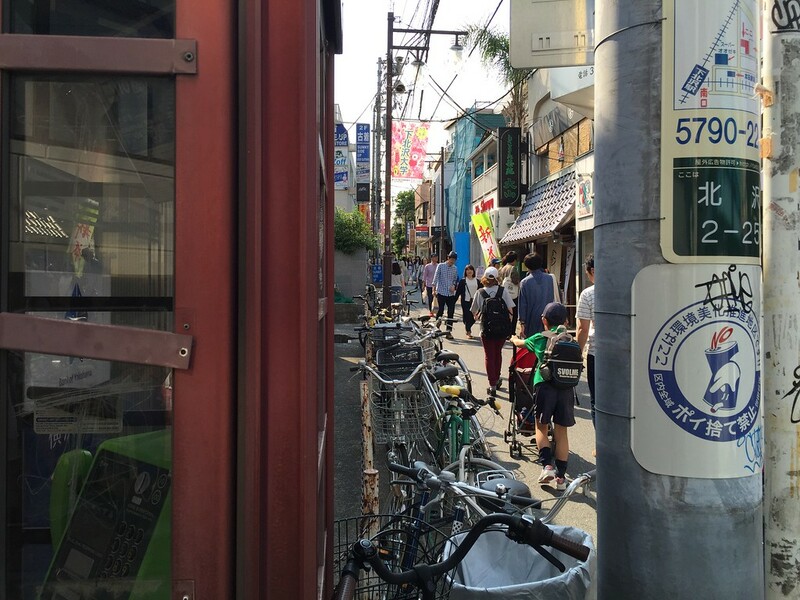 That’s about a full day in Shimokitazawa. Shopping, eating, drinking, music. The nice part is that it all happens in about ten square blocks on the north side of the Keio tracks. As mentioned previously, the south side has a lot to offer too. It’s just built up a bit more, a bit nosier, a bit more crowded, but with, as always, plenty to explore. Be sure to wear your walking shoes, and leave behind any desire to rush through the day. It’s more about the quality than it is about the quantity. 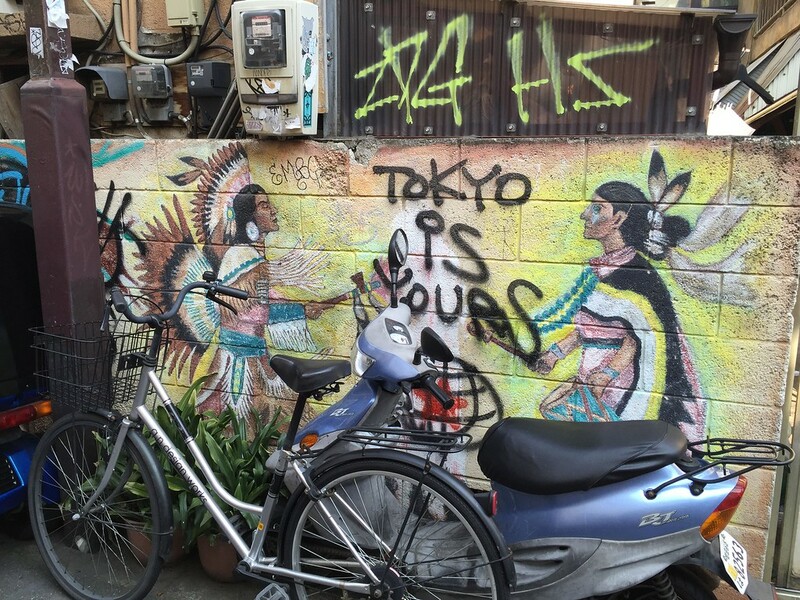 Hopefully by the time you arrive there will still be a quaint ole’ Shimokitazawa. Hopefully the station construction will be completed. And hopefully there will be no mimes. Mimes! Mario Leto is assistant professor in the School of Global Japanese Studies at Meiji University in Tokyo. His research and writing interests include travel, literature, and media discourse on food and dietary alternatives.